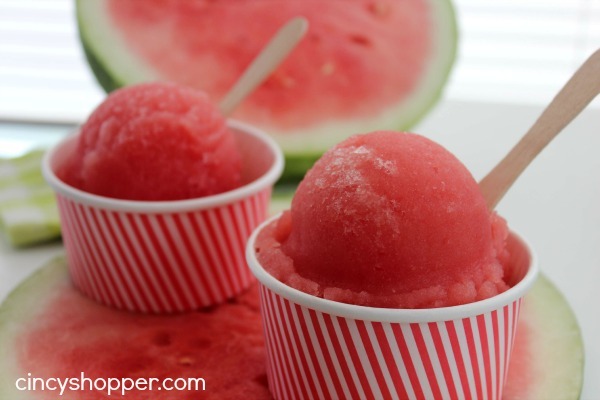 If you are looking for a refreshing dessert for this summer this Easy 4 Ingredient Watermelon Sorbet recipe is the answer. My hubby and I have been attempting to eat a bit better of a diet this past few weeks. He is one who is not a huge fan of fruit. I am slowly breaking him. He has a recent obsession with Watermelon (he loves my Watermelon Salsa I shared) so this Easy 4 Ingredient sorbet was the ticket. He will now be eating Watermelon sorbet on a regular basis. He says it is his new favorite summer treat. So I am really making progress, ha ha. 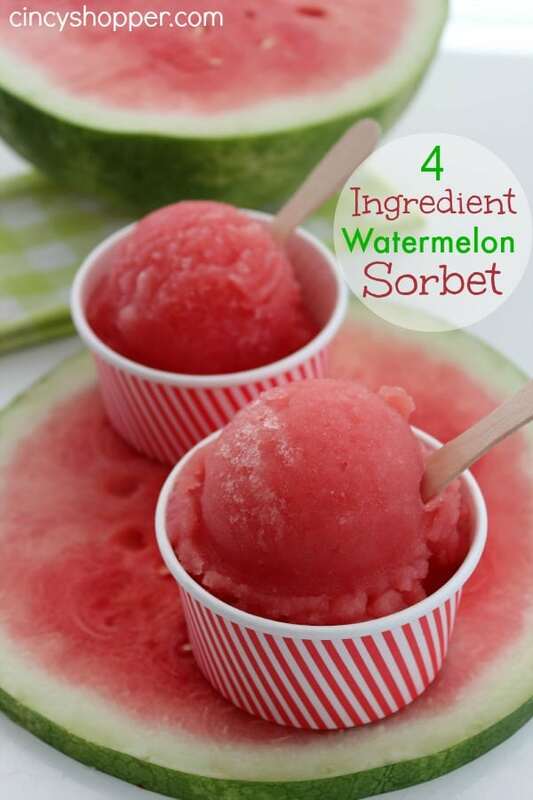 The baby and I shared a dish of this Easy 4 Ingredient Watermelon Sorbet after I grabbed pics and we are both loving it. So full of great watermelon flavor. I love that it is a light and refreshing dessert or treat for the kiddos. 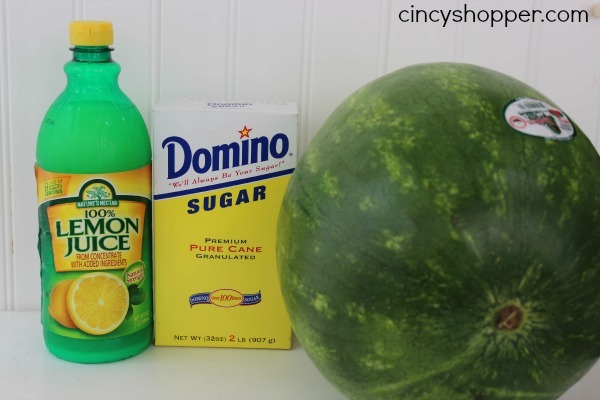 The four ingredients are so simple… just watermelon, sugar, lemon juice and water. This recipe makes enough sorbet to feed an decent sized picnic filled with adults and kiddos. Looking for other refreshing summer desserts? If so, be sure to see all the great treats I have been making here. place in a 13x9 dish, cover and place in freezer until firm. Looks delicious and refreshing, and your photos are gorgeous. Pinning! Pinned (wanted to stumble, but the links weren’t loading). Yay, a sorbet that doesn’t require an ice cream maker! This looks absolutely perfect for summer, so sweet and refreshing! What do you use to puree the frozen mix before serving? A blender? Food processor? A fork? Thanks, and I saw this on Anything Goes! Wow!! Love your presentation. Cant wait to try this recipe this summer. Why don’t you come link this lovely recipe to ‘NO BAKE DESSERTS’ Party . http://a-kaleidoscopic-dream.blogspot.com/2014/06/no-bake-desserts.html Thank You ! Oh I am definitely going to make this!!! Thanks for sharing it with us at the #WWDParty, have a great weekend! 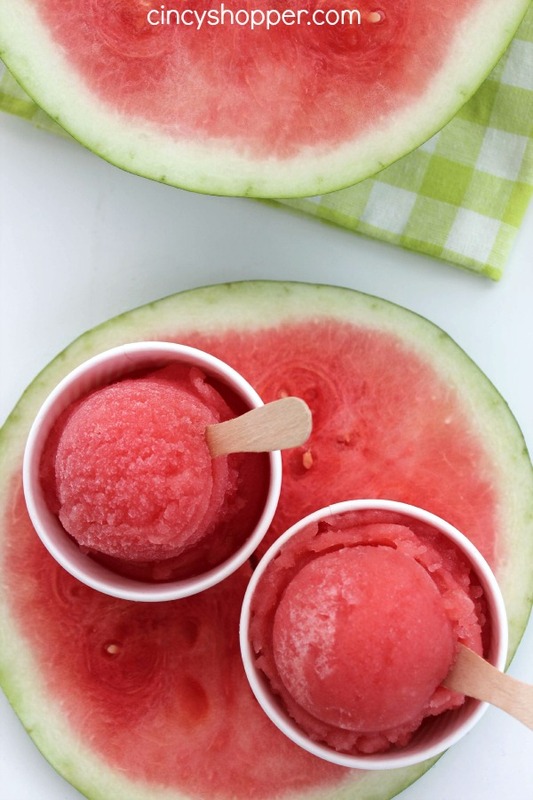 Watermelon makes such great frozen treats. I’ll have to try your sorbet in our ice cream maker. We also like watermelon slushies, but I really want to make watermelon sherbet too. Do you think this could be made with sugar substitute? It looks delicious! I was wondering the same thing. I’d like to use stevia, if it doesn’t ruin the recipe. How long do you freeze before you puree the second time? Can you substitute Splenda or Stevia for the sugar? My hubby is diabetic. Would love to find something yummy and fun that he can have. This looks so yummy! I have been craving sorbet lately. Can I feature this recipe on my blog and use one of your pictures? I will link it back to your blog and make sure that my readers know that this is YOUR recipe not mine. i made this the other day. It was fantastic. I thought that the watermelon would be to mild a flavour but it was the complete opposite. The watermelon flavour is really well captured. I am impressed. 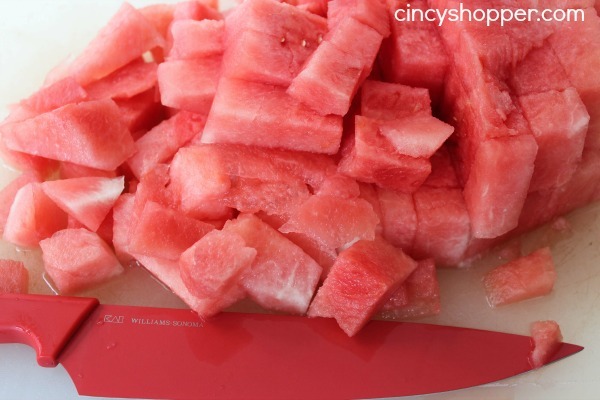 I can almost imagine every watermelon I purchase now making it’s way from blender to freezer to my smiling face. Lol. Thanks for sharing. Hi, I tried a recipe similar to this one, but I used only 1/2 cup of sugar (my watermelon was very sweet) and 1/3 cup lemon juice. I used an electric ice cream machine and it didn’t came out like a sorbet at all. Maybe if I’ll try now to put it all in a food processor (currently it’s a bit softer than a block of ice…). What did I do wrong? should I use a full cup of sugar next time? Watermelon is one of my favorite foods and it is Watermelon season. Ya! Thanks for sharing this gives me another way to keep mine around a little longer.